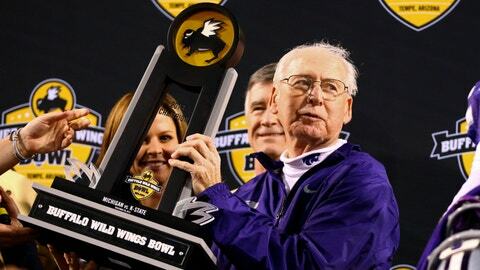 Legendary coach Bill Snyder was six-for-his-past 14 postseason contests going in to Saturday night's Buffalo Wild Wings Bowl. Open the season with a loss at home to North Dakota State. Finish it by corkscrew moonsaulting Michigan in the desert. Just like they drew it up, right? Sometimes this game makes no bloody sense. But that doesn’t make it any less beautiful. The Wicked Witch is dead. Whether you’re referring to the Wolverines or Kansas State’s bowl losing streak is up to you. Wildcats 31, Big Blue 14 is in the books, and the monkey on K-State coach Bill Snyder’s back has been replaced by a windbreaker drenched in Gatorade. Tyler Lockett (10 catches, 116 receiving yards, three touchdowns) was, deservedly, the most outstanding player of the 2013 Buffalo Wild Wings Bowl. But the night’s most outstanding moment might have come with two minutes and change left in the contest. All-Big 12 defensive end Ryan Mueller, game in hand, did a swim move and caught his fleeing 74-year-old coach on the sideline, the way he’d caught so many quarterbacks this fall. The giant cooler was emptied, which was hysterical enough. But things went from the comic to the sublime when the legendary coach turned back on his star defender angrily and pointed to the scoreboard, which at the time showed K-State up by 25 but with a healthy chunk of time still left on the clock. He was, as they say, not amused. Snyder threw Mueller a look that said, "If you weren’t the best defender coming back for me next fall, you’d be walking home from Tempe in bare feet." Then again, could you blame the enthusiasm? The last time the Wildcats won a bowl game, Miley Cyrus was 10 years old. Justin Bieber was 8. Taylor Swift was 13. Eleven years. Five straight postseason defeats. Snyder was six-for-his-past 14 postseason contests going in to the Buffalo Wild Wings Bowl, the only dent on an iconic, state-building tenure in the Flint Hills. The last time K-State (8-5) won a bowl game, Lockett was 10. Now he’s the first man ever to score three receiving touchdowns against Michigan in a postseason tilt. Wildcat quarterback Jake Waters strung together arguably his best game yet in a K-State uniform, eluding pressure, sensing the pocket, scrambling for big gains, eyes seemingly always facing front, scanning downfield. If it doesn’t kill what was left of the signal-caller debate in Manhattan, it’s on a standing eight count. Daniel Sams coughing away the ball on a draw with 45 seconds remaining in the third quarter, sapping the wind from a K-State drive in Michigan territory, didn’t help, either. Sometimes, even if it isn’t your year, it is your night. Hindsight will also say the stars were aligned, and that they were purple. A freshman quarterback for Michigan, making his first start. A blue-blooded, old-money team that rarely appears in mid-money bowls, much less gets up for them. Since 1983, the Wolverines have wrangled just five December postseason invites. They’re 1-4 in those contests. Since 2000, Big Blue is 5-5 in bowl games that don’t say "Rose" at the front. If it ain’t Pasadena, or it ain’t the Buckeyes or Irish, Michigan doesn’t give a flip. The Wildcats did. And the gap wasn’t just about hunger or desire; it was apparent in terms of preparation, too. K-State averaged 8.9 yards per play in the first half and was 4-for-4 on third downs out of the chute. Which had to be doubly sweet for Snyder, who had won three of his past five bowl games before putting those iconic headsets down the first time in November 2005. And triply sweet given that it was the program’s first-ever bowl win over a dance partner from the Big Ten (0-3 prior to Saturday), the league that launched Snyder into K-State’s orbit given the holy hell he’d raised as offensive coordinator at Iowa from 1979-88. The last time the Wildcats won a bowl game, a gallon of gas went for $1.34 a gallon, on average. Those were, indeed, the good old days. And, for one night at least, they’re back, and it’s been a long time coming. Too damn long.